As I mentioned in the first part of this article series, fiscal inter-governmental relations erode the principled foundations of a federation, such as our Constitutional Republic. They split responsibilities between governments without clear-cut, enforceable contracts to clarify responsibilities and preserve accountability. These inter-governmental fiscal relations come in two forms: federal to state, and state to local. There is a marginal, but growing relationship that runs from the federal government directly to local governments, causing a new kind of problems with state sovereignty. For now, we will leave the local government out of the picture (let us return to them later in the week) and focus instead on the federal-to-state relationship. To begin with, it might be worth noting that the statistical products that track federal funds to states have changed in recent years. For the longest time, the Census Bureau published Federal Aid to States, an annual series of publications that allowed detailed tracking of federal funding of programs in the states. It died, though, when the Census Bureau inexplicably terminated its Federal Financial Statistics program. Theoretically, this program was a duplicate of other statistical products, though in practice those products are difficult to access and require quite a bit of work for a moderate level of analysis. To get a reasonably detailed view of federal funds in states, we therefore turn to the states' own publication series on the matter, namely the annual State Expenditure Report from the National Association of State Budget Officers (NASBO). They provide data for almost 30 years, though only the past 15-20 years' worth of data is of acceptably consistent quality. Nevertheless, NASBO's numbers provide a comprehensive, and reasonably detailed, insight into how deeply the federal government participates in state spending. As we can see, Wyoming seems to be doing very well, being the second least dependent on federal funds. Technically, of course, this is true, but as recently as 2013 the federal share of state spending was 26 percent. What happened? Did we suddenly decide as a state to become more independent of the federal government? 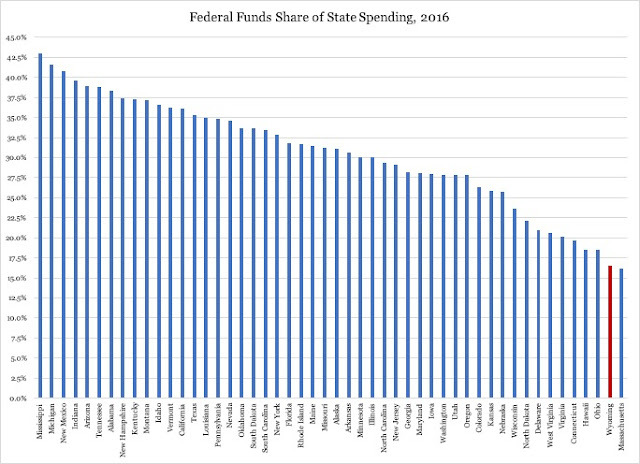 Perhaps the most compelling image that Table 1 conveys, in addition to the spike in Other Funds (which Speaker Harshman was kind enough to comment), is that Wyoming receives almost as much in federal funds as the state spends through the General Fund. This is a problem, especially since the debate over state spending often centers in on the General Fund. It is not inconceivable that, in a couple of years, the General Fund will be the smallest of the three categories of state spending, rendering it irrelevant as a gauge of the fiscal size of our state government. There is another side to the problems caused by the federal funds: in order to keep Uncle Sam happy enough to keep writing checks, states have to spend some of their own money to match the federal funds. The amount they have to add varies from program to program; in Medicaid the share tends to be 67 cents to $1 per dollar received from the federal government, leading to a 40/60 to 50/50 funding split between states and Congress. State matching requirements tie up in-state tax revenue that could have been used in other ways, or not collected at all from taxpayers, had the state decided to run the program in question without federal funds. This is no small problem: if we add together federal funds and the money a state has to spend to keep those funds coming, the state can, in effect, come to spend more than half of its total outlays according to federal regulations. While this is not the case in Wyoming - we are so good at spending our own money that we really do not need help from Congress - it is a not-inconceivable situation that might occur in the future. One reason to keep a watchful eye on the development of federal funds is that President Trump wants to create a new, federally sponsored, state-run program called "paid parental leave". This program has the potential of growing to Gargantuan proportions (see my criticism here, here and here), probably not under Trump, but under a future Democrat - or compassionately conservative - president. Another reason is the unrelenting question: what happens to the state when the federal government starts cutting federal funds to states? The same questions are important for the relations between the state and local governments. More on those relations in the next installment of this series. Are We Socializing Health Care in Wyoming?